So, I finally got around to seeing John Carter in the theater and wanted to share my thoughts on the film. For those unwilling to suffer through the lengthy commentary that follows, here's the short version: I enjoyed it -- enough that I'd be willing to watch it again -- even though it's flawed as a movie and deeply flawed as an adaptation of Burroughs. As longtime readers of this blog ought to know, I'm critical of Hollywood's inability (or unwillingness) to treat the literary source material on which it so often draws with respect. Consequently, I'm not a fan of either of the 1982 or 2011 Conan the Barbarian movies and I am even contemptuous of Peter Jackson's The Lord of the Rings movies. In the minds of many, this makes me a "purist," which is polite shorthand for "Puritanical snob I want to punch in the face." At the same time, I had a lot of faith in director Andrew Stanton, who did not merely profess but actually demonstrated in interviews that he loved and, more importantly, understood Edgar Rice Burroughs and his Barsoom novels. Contrast this with Milius or Jackson, both of whom showed again and again that they had no clue what Robert E. Howard or J.R.R. Tolkien were all about. My faith in Stanton was such that, seemingly alone amongst fans of the Barsoom novels, I wasn't put off by the various trailers released in advance of the film. Instead, I was relieved -- cheered even -- when I saw that movie would use the same framing device as the novel, A Princess of Mars, right down to including a fictional Burroughs as a character. To my mind, that fact alone already made John Carter a far more faithful adaptation than any movie purportedly about a Cimmerian barbarian to have appeared on screen. And while I had doubts about his casting choices, particularly the two leads, I was willing to give Stanton the benefit of the doubt. This was a man who knew and loved Barsoom, so I figured that any changes he might make would merely be those demanded by the translation to a different medium. Before proceeding further, I think a word about "the spirit" of a work is in order. In my experience, a great many people are willing to accept changes in a cinematic version of a beloved literary work if they believe the spirit of the original is preserved. Of course, the spirit is a fairly nebulous thing, so nebulous that talk of "staying true to the spirit" can often be used as an effective cover/justification for all manner of alterations. While I don't deny that books have spirits or that it's possible to discern them, I am wary of attempts to "stay true" to them while at the same time abandoning -- or contradicting -- their letter. I am, after all, the man who intensely dislikes the movie version of The Natural on the petty justification that it turns a tragic literary tale into a story of triumphant redemption. According to some, this constitutes staying true to the spirit of the book, so I hope I can be forgiven for being skeptical of such verbiage. It's worth noting that, all other considerations aside, bringing A Princess of Mars (the primary book on which John Carter is based) was always going to be a difficult proposition. The 1917 novel rambles, following John Carter as he wanders from place to place, meeting people and becoming involved in various intrigues on the Red Planet as he does so. Any cinematic adaptation that wasn't three or more hours long would likely have to concentrate on certain characters and events in order to present a more coherent narrative. In doing so, other events and characters would need to be minimized or dropped entirely, particularly those that don't support the coherent narrative the director has chosen to advance. I readily accept that, which is why I don't begrudge Stanton for most of his omissions. The movie version of Carter, though, is nothing like the one described here. He is a broken man, "lost in our world" (as the movie poster proclaims him), suffering from a (totally invented) tragic past. Movie Carter spends close to half the film seeking a way to escape Mars and return to Earth, where he believes a fortune in gold awaits him. Despite the wonders he sees on Barsoom, he cares little for the planet or its inhabitants, including Dejah Thoris, the first human-like being he encounters. He is sullen and self-obsessed, almost to the point of being anti-heroic. There is a moment in the film, shortly after he rescues the incomparable princess from the Zodangans when I thought, for a brief moment, that the real John Carter would finally make his debut. With hordes of baddies rushing at her, Carter grabs a sword -- her sword, which should have been my first clue about how this would end -- and stands in front of her, saying something to the effect of "Stay behind me, ma'am; this could get dangerous." But, apparently, chivalry is dead, even on the Red Planet. Dejah Thoris is offended by this Jasoomian effrontery and quickly shows Captain Carter that she needs no saving. The scene is, I expect, intended to be funny and to play with our expectations, but it has the effect of further lessening John Carter as both a character and as a hero. Granted I'm a Neanderthal, who wasn't too keen to see female warriors among the Slightly-Tan Martians either, but, even given that, I do think, purely from a storytelling perspective, having Dejah Thoris upstage Carter as a warrior so early in the story does little to make me like him as a character. Indeed, it only contributes to one of the film's biggest problems: why does anyone care about John Carter? Sure, he can jump very high and is equally strong, but so what? As portrayed in much of the movie, he's a withdrawn, bitter grump, who cares more about his riches on Earth than fate of Barsoom. Why would anyone follow this guy? "Because his name is in the title" seems to be the only explanation. Now, I understand why Stanton changed Carter's character -- to give him an "arc" -- but I hate it nonetheless. Not only does it deviate from Burroughs's portrayal of the character, but it actually made the plot of the film slower paced and less exciting than it ought to have been. When you only have two hours, give or take, to tell a story in a setting filled with wondrous and exotic things, wouldn't it save a lot of time if you don't have to waste time contriving ways to get your protagonist invested in that setting? Had the cinematic Carter been more like the adventurous Southern gentleman of Burroughs, we might have had time to see more of, say, the Warhoons or the atmosphere plants, two omissions I wished hadn't been made so as to allow for other stuff. Which brings me to the Therns. I'm honestly not sure what I think about the Therns. On the one hand, their inclusion is justifiable, since they provide a nice segue to The Gods of Mars. On the other hand, their portrayal in John Carter sets them up to be the Big Villains of the series, which is not only a mistake, but also necessitates lots of scenes with them delivering exposition that eats up screen time better spent fleshing out characters and situations that actually are in A Princess of Mars. It's another case where I think that Stanton and screenwriter Michael Chabon were too clever by half, inadvertently creating new narrative problems in an effort to "fix" those in the original text. As a result, the whole movie has a strangely "unfinished" feel, as if it's missing scenes that, if inserted, would help make sense of the whole. And yet, in spite of it all, I liked John Carter. It was a fun movie and, its downplaying of the Green Martians' cruelty and its liberation of Slightly-Tan Martian women to the contrary, a surprisingly old fashioned one in terms of the story it tried to tell. I could pick lots of little nits and quote lengthy sections of Burroughs's texts to show where Stanton and Chabon "got it wrong," but I won't, because I was entertained. I was also pleased to get to see on the big screen things I've imagined since I was a younger person. Were they exactly like I imagined them? No. In fact, a lot of stuff was downright unlike the way I'd imagined them. Yet, for all that, John Carter presented something that was recognizably inspired by Edgar Rice Burroughs's Barsoom tales -- far closer than any Tarzan movie to date and light years truer to its source than last year's Conan the Barbarian. I'd like to see John Carter again to get a better handle on my mixed feelings about it. I take it as a good sign that I'd even countenance a second viewing, despite my misgivings about it as both a movie and as an adaptation. I agree with pretty much all, but the answer (to all the doubts) is very simple: a perfect book-to-movie adaptation is not marketable. Oddly, I just watched the new Conan last night, aided by a generous quantity of Islay. The thing that really stood out was the amount of stuff and locations that they can manage to shoehorn into 90 plus minutes. This is not really a good thing. The vast majority of locations seemed to be present merely to show off how big and different the world was. They were very seldom developed in any depth and in some cases were actually pointless. A good example is the entire sequence featuring the breaking into the evil stronghold, after traveling to some foreign city to recruit a thief of questionable value, and the tentacle creature fight. After all this Conan sees that the enemy is riding away from the fortress to a skull cave and that all the prior effort was useless. He could have just sat in camp waiting for the enemy to leave their walls. Why fill time with such then? It sounds as if this is the main issue in John Carter, which is shame. The best part? The vast majority of locations are nowhere to be found in the stories, so they can't even function as a shout-out to the fans, since the diehard Conan fans know exactly as much about Khor Kalba, Shaipur, Argalon, Skull Rock, the Forbidden Forest and the monastery as complete neophytes. I didn't say best part, I said it was not a good thing. I literally said while watching the new Conan, "What the hell are all these places?!" To which my wife said, "I don't know. You're the one who read the stories and wanted to watch this crap." I did not mean to imply such, I was agreeing with you. I think what they ended up making was probably the best and most faithful adaptation that could have been expected. A lot of the additions they made were unnecessary, and I would have been happier with a movie that left more unexplained. But film-making is not a solo project, it's a team sport, and this was a Disney movie from start to finish. You're heaping a lot of blame on Stanton's shoulders for additions to the story and aesthetic qualities that could have likely come from the screen writer, the producers, the production staff, or even the actors. Personally, I really enjoyed the film and think it could have been a lot worse, but then I'm not the purist you are. I can understand playing down certain aspects of Carter's identity. I would have frankly been uncomfortable with lines like "our slaves fairly worshipped the ground he trod" in a 21st century adventure flick. But I think they did the character a disservice by throwing out the rest of the "Virginia cavalryman" archetype. They referred to it often enough, but I didn't really see it in evidence. The Thern seems to think that Carter's calling him "sir" automatically marks him as a Southerner when I think it would have been fairly standard for a 19th century man to do so. Also, book-Carter's quite unashamedly a warrior -- it's no accident he's on Mars, of all places ("I stretched my arms toward the god of my profession). We still like watching violent movie heroes. We're fine with oceans of blood and hacked-off limbs, but we (well, somebody, at any rate) seem to demand that the hero must always be at first unwilling, or they're seen to take an unseemly delight in all the bloodshed. That pleasure seems to be reserved for the audience. We're fine with oceans of blood and hacked-off limbs, but we (well, somebody, at any rate) seem to demand that the hero must always be at first unwilling, or they're seen to take an unseemly delight in all the bloodshed. "If I'm watching (or reading) a swashbuckling romance, I want to see unselfconscious gallantry mixed with a certain amount of bravado and ruthlessness." A decade in the military left me with little desire for war for war's sake in the real world. But I'll belly up to the table every week to kill orcs or Green Martians. Too bad the movie industry doesn't get that. I have to say that, in my case, Woola really added a lot to my enjoyment of the film. The fact he looks a lot like my cat might have had something to do with this, but I thought he was a Disney-style comic sidekick done right. Not too Jar Jar, and tough in his own right. I'm with you on this. I didn't really expect A Princess of Mars and didn't like how moody John Carter was portrayed...but it was still a fun movie and my wife - who has never read a single word of Burroughs - also enjoyed the movie, which made it a great night out. Which, in the end, is what makes a movie good for me. I agree with you on all front, James. I would have made a different movie with my $200 million dollars but there were things to like about it. Quite a bit of ERBs Barsoomian language was used - Jeddak, sak, kaor, odwar, haad, Cluros & Thuria, etc. The Tharks though anthropomorphized were recognizable. The airships were very well realized. The thoats were fine. Woola was quite endearing - at least he didn't talk or - Issus forbid - sing. I sort of liked the meta-plot involving the Therns. It reminded my on HPL's Great Race. They were other things I did not like. I didn't care for Carter's back story - I found it intrusive. There was no reason Zodanga had to be a "walking" city. It seemed abrupt when Dejah appeared on the airship over Thark. Non-fans could have used a transitional scene with her fleeing Helium. The score was completely unmemorable. A last category would be parts of the film which I thought may have contributed to it's critical/box office failure. I enjoyed the ERB framing sequence but I think it may have been too much for those who were not ERB fans. I also liked the Arizona preamble but again it was rather long. The marketing was utterly fubar. I've seen moody angst trailers, action TV spots, and even a kiddy-fied "Galactic Arena Battle" bumper with John Carter and White Apes. Nowhere is the connection made to ERB, Tarzan, Pixar (!? ), or even Mars. Question for those who've read the books: how accurate was the depiction of the Tharks? They were my favorite part of the movie, and if they're that much fun in the books, I need to read them. To quote the orks of Warhammer 40k: Green Iz Da Best! And speaking of the books... I should have known this movie was doomed when I found out my local library doesn't even carry any Barsoom books. The green martians are somewhat humanized. The don't have bulging eyes or antenna like ears. They are somewhat shorter than described but still taller than humans. They were also quite thin though some artists have depicted than that way. You do need to read the books, yes. The Tharks are pretty close from my point of view, though they deserved a lot more screentime. Warhammer 40k's orks are, in many ways, a lot more like the Tharks than LotR's orcs: a communal society with no recognized mothers or fathers except "the horde," where the concept of ownership is purely based on getting the stuff of the bloke you kill, they scavenge higher technology and have the uncanny ability to use it, no sense of love or art or compassion. Tars Tarkas and Sola are noted exceptions, a relic from the Tharks' noble past. Plus green skin and tusks. The Tharks were described as 15 feet tall, slits for noses, long teeth that form tusks, and with eyes on the side of their heads so they can look forwards and backwards at the same time. True, but in terms of character, society and general temparement they were closer than I thought they'd get. They are far more anthropomorphised than I would've liked (I particularly miss the independent movement of each eye, too, that would've been a cool thing to see), but this is Disney, who anthropomorphise Dinosaurs in an otherwise hyperrealistic CGI movie. "Now, I understand why Stanton changed Carter's character -- to give him an "arc" -- but I hate it nonetheless. Not only does it deviate from Burroughs's portrayal of the character, but it actually made the plot of the film slower paced and less exciting than it ought to have been." This is something that i'm very much getting sick of. Not everyone needs a backstory, sometimes i don't care about the origin, or his backstory, i just get me stuck into the movie. Its the same issue i have with a lot of comic book movies the last several years, why does it matter that Green Lantern's magic ring is really super space science, or how Spiderman's webbing is organic or also super science. I get it, they are heros, they have powers, move along now. I highly recommend seeing the movie again. On my first viewing, I spent so much time looking for accuracy to the book, I missed out on the "movie" itself, and I even knew going into the theater that this was not going to be a strict telling of the story. Watching it a second time, however, I let go my prejudices against the film and found I thouroughly enjoyed the film as a good representation of the true "sword & planet" genre. As an aside, I treated some of my gaming group to the movie, all of which have never read the books and know very little about John Carter or the planetary romance genre. After the movie, however, they wanted to play an rpg in a similar setting, and wondered why I had never offered to run such a game. I sense some derring do on a distant world for the love of a beautiful Princess in the future. If anything, the movie was excellent for that alone. I'm heartened by these comments, because I think how you described your first viewing was similar to my own experience. Even as I was watching the film and then left the theater, I felt like I had missed out on something due to my preoccupation with the source material. I look forward to a second viewing ... and, perhaps, even subsequent ones. I haven't seen John Carter yet so I may not really know what I'm talking about here, but I wonder of some of the blame can be laid at Michael Chabon's feet? I've always felt there was something a bit condescending about his brand of "genre fiction for people who don't read genre fiction." I'm not a fan of either of the 1982 or 2011 Conan the Barbarian movies and I am even contemptuous of Peter Jackson's The Lord of the Rings movies. In the minds of many, this makes me a "purist," which is polite shorthand for "Puritanical snob I want to punch in the face." ...haven't you repeatedly self-described as a 'puritanical snob'? Had the cinematic Carter been more like the adventurous Southern gentleman of Burroughs, we might have had time to see more of, say, the Warhoons or the atmosphere plants, two omissions I wished hadn't been made so as to allow for other stuff. Were the Warhoons entirely omitted? The Great Games of Warhoon are the best action set piece in the book, and would have made an incredible montage in the film. The "Dejah Thoris, Warrior Princess" thing also rankles... if the producers of the film wanted an "empowering" female character, the cack-handed changes they made are really shallow, and not all that female-friendly. Dejah Thoris is presented as the leader of a scientific expedition who, captured by hostile monsters, is able to make a diplomatic offer to her captors almost sufficient to thaw a Thark's heart- is that not an empowering portrayal? And tragic backstory? There's already a major character with a tragic backstory in the book. I'd been considering seeing the film, but I think I'd end up being thrown out of the theater, should I watch it. The Warhoons are only largely omitted. They are the tribe of animalistic Green Men who work with the Thern at the end of the River Iss in the movie. I confess that I forget who set up the arena battle with the white apes, but that may have been Warhoons as well (and I would appreciate correction from anyone who does remember well how that scene was set up). The area battle with the White Apes occurs late in the film when JC return to Thark after Tar Tarkas has been deposed. Ah, yes. Thank you, Captain Jack. Can anyone define what an Edgar Rice Burroughs/John Carter purist is when he's at home? Not ERB himself, I imagine: he seems to have been an enthusiastic kitchen-sink wielder. I just took over running the local mall office of a national market research company. We do mall intercept surveys, the people that work for me go out into the mall and try to get random shoppers to do surveys for money. Our biggest client does computer administered tests of unreleased movie trailers for several of the major motion picture studios. We worked on the John Carter project and I was pissed from the beginning that they left off the "of Mars" from the title. Why?!? If you haven't read the books you have no idea who John Carter is, so naming the film after him makes absolutely no sense if you don't include the "of Mars". What was really interesting is that the studios tested a large number of different versions of the trailer and seemed to be having a harder time than normal knowing how to promote the picture. I can't give away any more specifics because of my contractual obligations but it was really interesting for me as a reader of the books and someone who has long fantasized about running a campaign on the red planet to hear people who had never heard of the series critique the trailers of the movie. There was widespread confusion about what exactly the movie was trying to be or do, even though the general reaction was positive. This actually seems to line up with your experience as well James. John Carter was my anatomy teacher at university. Lovely bloke, enthusiastic about art, introduced me to a couple of portrait painters. No, really: this was a marketing misstep beyond belief - not a rookie mistake so much as the kind of gaffe a comedy alien would pull in 3rd Rock from the Sun. I blame the Therns. Hollywood, if I may be so bold as to use it as a collective noun, has always had great difficulty deciding how to market something that it sees as breaking genre conventions. And the distributors and cineplexes take their cue from the marketeers, so any confusion (as was quite apparent with the title changes and larger than standard test screenings) is passed on to them. After all. It's not scifi. There are no spaceships or talking squid. It's not fantasy. There are no hobbits or elves. It's not a western. At least, not for most of the movie. It's not a romantic comedy. Etc. The cinemas want a genre, a simple pigeonhole, because it makes it easier to tell people what the movie is about. Even if it's the wrong pigeonhole. And the planetary romance genre has been mostly forgotten by movie-goers with the old Republic serials (and in many cases you can't use those as a precedent because other people hold the trademarks to them). So yes, they should have used "of Mars." I have to say that the one serious complaint I have with the movie is the extraneous (I use that word very deliberately) backstory given to Carter. As you note, it forces Carter into a personality rather at odds with the one he displays in the book, but it also distorts one of the many issues (albeit a significant one) with which the books deal: the place of honor in minimizing the social disruption inherent in violence. To my way of thinking, this is due to one of the problems of Hollywood culture. It is incapable of properly understanding honor as a social phenomenon (similarly, it is incapable of dealing with religious feeling of any sort well - I don't think that this is coincidental, as both problems seem to derive from similar cultural traits), since the culture sees such things as alien or outdated attitudes. More's the pity, as stories are /inspirational/ they really should feature someone to be inspired by. Someone should tell them that stories form the bedrock of culture and therefore they should be handled responsibly; they need to be interrupted in their rush to make a hoard of gold as they're incapable of thinking like this on their own. Your complaint about the additions mirror the reaction that has kept me out of theaters and waiting for Netflix. I was all primed to go opening weekend when Amazon emailed me recommending the movie novelization which also included the original A Princess of Mars. If you adapt a novel into a movie and change it so much that you can sell a separate movie novelization different from the novel you're adapting I consider that fail. Your review, along with others, is only reinforcing my Netflix it conclusion. Oh well, another bomb movie adapataion. I've never seem a better adaptation of a book than "The Road" (novel by Cormac Macarthy). All directors and screenwriters should read the novel then see the movie and learn how it's done. At this point I'm not even sure which one I like better, they are both that good. I was reluctant but willing to give this movie a chance, but after reading your review I've decided to spare myself from the inevitable anger and unhappiness that would result from a viewing. For me, the spirit of A Princess of Mars is the spirit of John Carter himself, and if the filmmakers can't be faithful to that crucial aspect, then the whole endeavor was a waste of time. With a personality as strong and interesting as John Carter's, fabricated backstories and story arc clichés are a serious detraction. 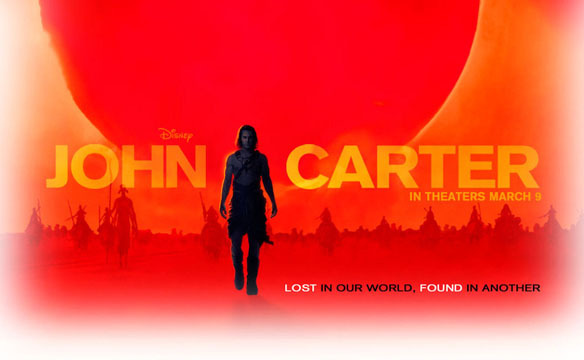 Incidentally, the clue that this movie would be anathema to ERB fans is the fact that it is advertised as "Disney's" John Carter. This is a slap in the face. They had no true intention to honor ERB's works nor his fans. Note I'm not even complaining about all the details that viewers and movie reviewers have stated are in error. The character of John Carter is far from a detail. Heck, they even named the film after him. Oh, and A Princess of Mars was published in 1912, not 1917. The novel was first published in 1912 in the magazine All-Story as "Under The Moons Of Mars" by Norman Bean; it was not published as a book until 1917, when it received its now-famous title. Very true. Thanks for the elucidation. IMHO the last Conan movie is simply horrible in every single aspect (script, acting, characters, dialogues, costumes etc. ), but I love the 82 conan movie even if it's in some part different from REH's original character. I've yet to see John Carter (never quite understood why they cut out From Mars from the title) but I don't agree with your statements about Conan (1981) and The Lord of the Rings. Both are spectacular achievements in that they capture the feel of the original books. Granted, no hardened fan of Conan will ever accept the Conan movie as anything else other than a feeble attempt at adapting Howard's stories to the big screen, but for those who never read the tales of the Cimmerian, it's a good point of entry. How did Jackson show "again and again that [he] had no clue what J.R.R. Tolkien is all about." That's just a ridiculous statement. I don't want to derail the comments about John Carter with a digression about Jackson's films, so I'll be brief: the fact that nowhere in the movies do we here talk of "the long defeat" rankles. It, combined with many examples of facile optimism, suggests clearly to me that Jackson did not understand Tolkien or his worldview at all. The Lord of the Rings is not a hopeful work; it's an elegy to the passing of an age whose like shall never be seen again. The films, as enjoyable as they are as a fantasy war epic simply do not convey this. LotR is both a hopeful work *and* an elegy -- there's a reason it ends on Sam's return to Rosie and his children ("Well, I'm back.") and not on Frodo/Bilbo vanishing into the sunset. I love you and your deep thoughts, James, but honestly I think PJ might 'get' Tolkien better than you. Actually, I just think you're a contrarian by nature and refuse to give the films a fair shake on principle. You do the same thing with the first Conan, which remains the best sword and sorcery ever put to film. Me? Whatever gave you that idea? James, you touched on pretty much every point I made in my review of the film a couple of weeks ago. I wanted to like it, I really did, and I am fully aware of the fact that sometimes changes need to be made for the sake of a new medium, but the changes introduced / made in this film were not only unnecessary, they ate up valuable screen time that could have been put to far better use. @cherryfunk - yeah, I pretty much agree. I really disliked all the Conan movies, but I honestly can't see how the LOTR movies could have been much better. Yeah sure, stuff was changed...but the final result did a marvelous job of capturing the spirit of the books afaic. Those movies really lined up marvelously with my own imaginative vision of what Tolkien's world and characters should be like. Really? You thought Aragorn was a reluctant hero unsure of his destiny whose future father-in-law thought him unworthy of his daughter? You thought Gimli was a comic relief sidekick utterly lacking in dignity and Legolas a showboating braggart? I could go on, but there were many, many divergences between the novel and the films and they're not petty, nitpicky things like "Legolas's hair was the wrong color" (though it probably was). Jackson and his screenwriters changed fundamental aspects of many characters, making them not just different but opposite what they were like in the novel and that's problematic in my opinion. Frankly, I didn't think the characters of Aragorn, Gimli and Legolas came off in the films the way you describe them - at least not in a major way. In the films, Aragorn was heroic, Gimli was quite dignified (but admittedly humorous) and Legolas wasn't such a "showboating braggart" afaic... yeah, they played close enough to the books for me. I am fully sympathetic to your complaint about Jackson's films, but you picked a poor example to lead off with. Aragorn certainly has moments where he questions his worthiness, most notably after the death of Boromir: "This is a bitter end. Now the Company is all in ruin. It is I that have failed. Vain was Gandalf's trust in me." The films undoubtedly make too much of this, but at least they build on an aspect of Aragorn's character that is actually present in the novel. Similarly, "The Tale of Aragorn and Arwen" in Appendix A suggests that Elrond does think Aragorn unworthy of Arwen: "But as for Arwen the Fair,lady of Imladris and Lorien, Evenstar of her people, she is of lineage greater than yours,and she has lived already in the world so long that to her you are but as a yearling shoot before a young birch of many summers. She is too far above you." I readily concede that some of my criticisms miss their mark, but I nevertheless feel that the movies do the novel a disservice, coarsening and otherwise weakening its themes in order to make it more acceptable to a contemporary worldview that would have been rejected by Tolkien. I read the original drafts of the scripts -- you would not believe how much better the finished films were. There's no way in hell we were ever going to get a better trilogy of films out of Hollywood -- indeed it's an absolute miracle PJ managed to make them as true to the novel as he did. And even you, oh curmudgeonly one, must be impressed by the cast and their performances. Ian McKellen as Gandalf? Bernard Hill as Theoden? Tremendous performances. I've said before -- on this blog, no less -- that I do think it's a miracle we got movies as good as we got. There's a lot to like in them, but very little of what's good comes from Jackson and his comrades' imaginations but rather from Tolkien's. The farther they strayed from the text, the worse the movies are in my opinion -- and they stray a lot more than I'd have preferred. "I am even contemptuous of Peter Jackson's The Lord of the Rings movies...."
'Contemptuous'? A bit strong, no? You might not be entirely satisfied with them, you might be disappointed in their textual accuracy, but to have *contempt* for arguably the finest fantasy films ever produced? Point taken. "Contemptuous" was probably too strong a word. @Dwarin:"no hardened fan of Conan will ever accept the Conan movie as anything else other than a feeble attempt at adapting Howard's stories to the big screen"
I agree with James about Gimli (the dwarf comedian wasn't a good idea) but I still think PJ's LOTR is a good trilogy and deserves all oscars he won. Yes, I am a Tolkien fan since the jurassic era ;-) but I like those movies. The Disneyfied look of the Tharks from the previews was my first clue that this wass not something I'd want to watch. Unlike a lot of folks, if I really like a book I'd just as soon NOT see it made into a movie... especially the sort of corporate by-committee thing that $200 million basically ensures. I havent read the John Carter books but I did enjoy the film enough to get me to start, so even if there were some seriously problematic issues(without reading the book though I didn't know! )with the film it was a win for me. I love the first Conan movie. I have read all the REH conan, and half of a Robert Jordan story(Only half, I just couldnt cope with it!) and I would be the first to admit that the movie is far different from the stories. What possibly helps for me is that the movie story isnt an adaptation of a written story, more a borrowing of the character, to the point where he just might be a totally different Cimmerian by the name of Conan. I have to agree with James. The characters felt completely different for no apparent reason. Faramir taking Frodo to Osgiliath and nearly not showing his true character. The ghost army wiping out the Orcs at Minis Tirith making the Riders of Rohan charge seem like a waste of time. ie if they had waited the ghosts would have done all the work! The list goes on and on. What really ercked me was none of the heroes seeming to want to be heroes. They all had to tricked, cajoled or forced! To those of you holding off seeing John Carter (of Mars): don't. Go see the movie. See it at the half-priced showing if you have to, but go see the movie. Waiting for Netflix to get it is a mistake (unless your home has a theater set up with attendant huge screen). Go see the movie - your money won't be wasted. James isn't happy with it and he plans on seeing it again. Just don't buy the popcorn...that's just crazy. I agree. Whatever problems there are with the story (and they are not insurmountable, nor are they all that numerous), the visual elements are beautiful and worth seeing in the large format. whatever the case is with this movie, it has to be better than The Hunger Games. which was one of the worst movies ive ever seen in my life. Deus Ex Machina until you vomit Willy Wonka aesthetics and The Running Man done lame. This hits one of my gripes with the whole John Carter movie's chances of success. I don't think JC is a bad movie, yet critics are ready to give it a beating while letting the Hunger Games get a pass because "it touches on real-life concerns in our society" (to quote some reviews). Please explain to me how a teen drama about reality-TV bloodsports set in a destitute future America is any more "real" than a action-adventure movie about a man lost on another world fighting against a despot and his personal loss? I'm guessing it has more to do with demographics and one is a recent popular book and less to do with story or a movie's quality. I found JC to be solidly entertaining. For me, the best part was seeing Barsoom visualized in a way that was quite different from my own imaginings, but still plausibly connected to the books. The worst part was the previously noted "backstory" for JC himself. I am fully on board with Science Warrior Princess Dejah Thoris. I confess I always found DT in the books to be weak sauce, constrained as she is by the the conventions of a 1910s romantic heroine. For me, Thuvia, with her independent spirit and can do attitude was always the much more intriguing female character. With the "Thuvia-ization" of Deja in the movie, along with being embodied by Lynn Collins, Dejah goes a big step toward reclaiming her title of hottest babe on 9 planets. As for the alterations to the Therns, I actually found that tweak intriguing. I would have like to see how it paid off in Gods of Mars, but with JC being (I feel unjustly) savaged in the press. I doubt we'll ever see that. Savagist, I have to say that re Hunger Games, we seem to have seen very different movies, as mine was well pace, excellently acted, and pitch perfect. Specifically, the look of the citizens of Capitol seemed straight out of the book to me. I am curious however if you have read the books, since I thought I might have been unconsciously filling in back story that wouldn't have been apparent to someone seeing the movie fresh. I know at least one person who did that and was significantly less impressed than I by the film. So that's a potential flaw. On Dejah Thoris: I completely agree. One of the things I noted elsewhere was that, in the 1910s, there was a very different idea of what makes a woman "incomparable" than we have today. I was a little put out about making her a better swordswoman than John Carter was a swordsman (and that falls into the criticism of the Carter Backstory in the film), but other than that, the independent-minded, active Science Princess was an excellent choice for representing what she meant to the story, in my opinion. I'm re-reading the Barsoom series and am on book #4 at the moment so I can't recall exactly where I saw it, but I know I recently encountered a reference to Dejah Thoris having been trained with a sword. She shouldn't be better than John Carter, but in the movie they managed some fun banter when they first started fighting side-by-side. Today was my 3rd viewing of the movie and for the first time there were a bunch of kids in the theatre. It was interesting along the way to see where the kids laughed. They seemed to love Woola and some of the more comedic scenes entertained them as well. I saw a theatre of kids who enjoyed the movie. My sister (who has never read any of the books) enjoyed the movie. I think sometimes we get too hung up on "realism" or reinactment and forget that sometimes movies can just be fun. We will be taking our 9 y.o. daughters. Any thoughts on the intensity of the movie? If your daughter has seen LOTR and similar movies, JOHN CARTER should be no problem for her at all! Your post inspired me to Google Books the Princess of Mars. After a few chapters I am struck by the thematic depth of the work, which flew over my head completely as a pre-adolescent twenty years back. Indeed, ERB treated the issues of violence, chivalry, and honor at a depth where Hollywood drowns. I am not surprised you found the movie somewhat disappointing, although you tout it as "a fun movie and ... a surprisingly old fashioned one in terms of the story it tried to tell". Of course the trouble is that half or more of the story is ERB wrestling with how Modernism (including women's suffrage and emancipation) upended the expectations of his upbringing. Bringing that struggle to the screen would have made the movie historical science fiction, which is so far from being in a pigeonhole that it is simply unimaginable except as an outside-shot Oscar nomination. Personally I would love to see an Edgar Rice Burroughs biopic where the writing and action of Princess of Mars serve as the central conceit. Having recently seen this myself, and knowing your views of such adaptations, I was curious as to your reaction. I am glad to hear that you felt it was a somewhat worthy movie. Since I have never read the stories, I went in with no real expectation other than a fun movie. I got that, in spades. I also got the desire to go and buy as much Burroughs as i could find collected under a single cover. In this way, i feel the movie is a success despite ant nits to be picked or money to be lost. It inspired me to want to read the original stories. Peter Jackson (damned be his name!) makes a point of portraying every character as the polar opposite of his book self. Thus Pippin and Merry are not smart but retarded, Gandalf is no longer an old wise man but an histerical fool, Frodo is a chickenheart, Arwen a virago, etcetera. Sauron is wearing a *shining* armor and bursts in a flash of *pristine white* light when defeated! The movie audience thinks they know LoTR when all they got was a Monty Python parody of the books. Michael Moorcock himself couldn't do it worse.